The indoor plants could not direct sunlight, or there is no enough sunlight and the weather is bad in the winter time, which may stop the grow of your lovely plants or make them dead. The LED grow light could resolve the problem to provide the plants enough light needed. Many customers told us it brought their dying plants to life.What's more, it is long-lasting, energy saving and no pollution. We have many happy customers worldwide. Compared to high pressure sodium, fluorescent, high- intensity discharge or incandescent lamps, they have a much longer life. Gooseneck length(from head to clip): 15"
-The Blue light (Wavelength around 450nm) helps to induce chlorophyll and carotenoid, which are necessary for healthy leaves. It can promote plant germination,growth of stem and leaf, and the growth of succulent plant . -The Red light(Wavelength around 630nm) can promote plant photosynthesis,blooming,flowing and results. We stand by our products. A happy purchasing experience is our #1 priority and we will happily send a product replacement if any issues arise.Please feel free to write us an e-mail if you need any help,we would try our best to response within 24 hours. Upgrated LED Plant Growing light fixture. Our 10W LED growlight is much brighter than the common desktop grow light on the market and offer better spectrum the plants need. 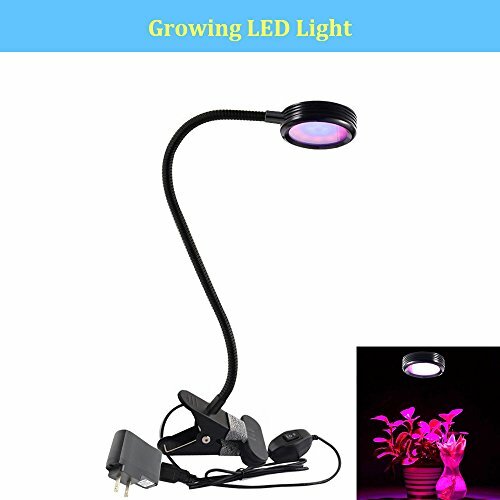 It gives off wavelengths (including 450nm and 660nm) light ray to help accelerate the growth of indoor plants, foliage plants, flowering plants, succulent plants, potted plants, promoting leaves and flowers blooming. Adjustable design. The 2-level brightness of the Red and Blue light colors and flexible gooseneck enables you to choose the favorite light and distance to your plants. The brightness and combination of Red and Blue light colors can be controlled by the 2 separated switches.You can adjust the light based on the condition of your plants. Spectrum and Plant Growth. The Blue light (Wavelength around 450nm) helps to induce Chlorophyll and Carotenoid, which are necessary for healthy leaves. It can promote plant germination,growth of stem and leaf, and the growth of succulent plant . The Red light(Wavelength around 630nm) can promote plant photosynthesis,blooming,flowing and results. Easy to use. Plug and play. Compact design, tight metal clip, 3-Way to fix the clamp (Clip, Screw or Stick). It can be placed anywhere you want to put. Easy to install at your home or office. Perfect for desktop plants and any other Indoor Plants Hydroponic Garden Greenhouse. Great Gift for Garden enthusiast Friends and Kids.Elegant Christmas Gift,Birthday Gift,New Year Gift. If you have any questions about this product by Makergroup, contact us by completing and submitting the form below. If you are looking for a specif part number, please include it with your message.